The civil society representatives under the banner of social activist Anna Hazare held a peaceful hunger protest today at Rajghat in the nation's Capital. Close to thousands of men from the Delhi police and its armed unit threw a security ring in and around the Rajghat where social activist Anna Hazare and others sat on a day-long hunger strike in central Delhi this morning. The BJP legislature party passed a resolution in its meeting today condemning the Prime Minister's statement that the incident regarding the police action on Baba Ramdev and his followers was unfortunate but "necessary". Under attack from all quarters after its forcible evacuation of yoga guru Baba Ramdev and his supporters from Ramlila Maidan on the night of June 4-5, the CCTV footage of the night points towards Delhi police showing restraint in the face of grave provocation and humiliation by yoga guru's supporters. About 17,000 candidates have registered for the Scheduled Castes/Scheduled Tribes category and around 450 for physically disabled quota as Delhi University completed its registration process for these categories, a university official said today. While Congress general secretary Rahul Gandhi was quick to show his sympathy with the people of Bhatta-Parsaul village against alleged police excesses despite their attack on the district magistrate and killing of two policemen here, scores of people from the area who were present at Ramlila Maidan on the night of the police action are wondering what the Gandhi scion has to say about the crackdown on Baba Ramdev and his followers. By presenting the cheques for financial help to the Bhatta Parsaul farmers who were the victims of police atrocities, the state government has tried to assuage their sufferings. The Public Works Department, Delhi government, has submitted the relevant documents of six projects of the CWG to the CBI which were needed to investigate the cases of financial irregularities. The Delhi police has arrested two youths who were involved in a double murder case. The accused have been identified as Padam (22) and Bhushan Singh (20), both residents of Ghori-Bachera village in Greater Noida. Delhi Sikh Gurdwara Management Committee spends lakhs of rupees on advertisement for inauguration of proposed parking lot in Rakab Ganj Gurdwara that is misuse of the donations. A team of experts from Central Building Research Institute (CBRI), Roorki, along with the officials of the Municipal Corporation of Delhi (MCD), today visited Janak Setu to carry out extensive inspection with regard to its overall structural stability and the recent sagging of the structure. A newly renovated conference hall at the Press Club of India was inaugurated by defence minister AK Antony here this morning. The police today claimed to have busted a gang of vehicle thieves with the arrest of two men and recovery of four stolen cars. "Those arrested were identified as Anshu and Bobby. They were arrested last night," SP (city) Anant Dev said at a press conference at Sector 20 police station here. Thousands of supporters of the anti-graft Jan Lokpal Bill also chose to be on a one-day fast to oppose the government's high-handed approach on the matter. Expressing their solidarity to the cause, they also raised slogans against the government. While condemning the Saturday-Sunday midnight police crackdown, many suggested that people, such as Anna Hazare should fight elections with party tickets to effect a resurgence of the actual democracy. "This government is no better than the British's. They applied force on innocent people, women and children at Baba Ramdev's Satyagraha. You enter any department, everywhere you are asked for bribe. I had to pay Rs 3,000 in NTPC for getting a work done," rued Bhuvnesh Kumar, a retired Central government employee who had come from Mukherjee Nagar to join the protest. He was not alone airing out his anger against the government. One Pratap Singh (name changed) who had come with his family and his 70-year-old mother from Ghaziabad, was transferred when he raised voice against his bosses. "To remain in the sytem, you have to become a part of the corrupt system," he said. Questioning government intentions, many like 68-year-old Manju Jain of Green Park, said, "The incident of crackdown was an insult to democracy. People's power has been curtailed," she observed. Such was the fervour, with the area and its vicinity resounding with patriotic songs and thunderous claps that many termed the campaign against corruption as the stepping stone for a revolution. 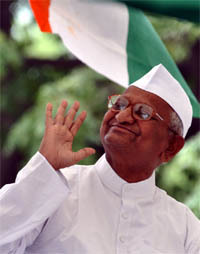 Hailing people to rise up to the occasion, the Magsaysay awardee Hazare said, "The government is not scared. It wants to suppress people's voice. But now the second war of the Independence has begun. It has been making allegations against the civil society members of the joint Lokpal drafting committee." While initially over 500 police personnel were holding forte, two more battalions were called in after rumours of yoga guru Baba Ramdev joining Hazare started making rounds around afternoon. The venue, which was chosen by the Delhi police for the protest, was thronged by khakhi-clad men hours before the scheduled time of 10 am. While scores of policemen were seen guarding the venue last night itself, more than 100 officials took guard even before 7 am today. By the time senior police officials like police commissioner BK Gupta and special commissioner Dharmendra Kumar came for inspection, over 500 policemen had already taken positions. Meanwhile, cordoning off of the premises by the police and traffic diversions caused inconvenience to protestors, who felt that the police presence was far more than required. "When I came here around 9 am there were more policemen than protestors. I don't understand what is the need of deploying so many policemen here? Perhaps, the police knows it better," said Ram Naresh, a Dwarka resident sitting on protest. Hazare and other members of the civil society called for the token fast at the Rajghat, memorial to Father of the Nation Mahatma Gandhi, to protest against the police crackdown on Ramdev and his supporters at the Ramlila Grounds on the night of June 4. As part of security arrangements, four body scanners, a fire brigade and an ambulance were kept on standby at the Rajghat while visitors were frisked for even cigarettes and match boxes. The Leader of the Opposition in the Delhi Legislative Assembly, Vijay Kumar Malhotra said it was not understood why a violent police crackdown on sleeping people was taken. They were lathicharged, teargas shells were lobbed on them. About 100 people sustained injuries. One of them, Raj Bala, is fighting for her life. There has never been any incident before or after the Independence where teargas was used in a closed enclosure. The barbaric attack on silent, peaceful volunteers reminds the excesses of the emergency. Malhotra said Congress general secretary Rahul Gandhi had shown his fascist personality by asking the ministers in the government and his partymen to strongly defend this dastardly act. The legislature party also castigated the Chief Minister for being silent on the issue and refusing to even visit the injured in hospitals and noted the extent of her insensitivity. As per the footage available with the Delhi police, an Additional DCP is seen standing with folded hands amidst a group of women who had torn off her dress while she was trying to calm them. Talking about the footage, a senior police official from the Central district said that even senior police officials of the rank of Joint Commissioner and DCP were pushed around by Baba's supporters in and around the stage when they went to hand over an official letter to him about cancelling the permission to hold a yoga camp at the venue. "This lady officer is visible in video footages with folded hands, trying to calm the agitated women around her while they tear off a part of her dress. As this was happening in the crowd, senior police officials, including Joint Commissioner (North) and DCP (Central) behind the dais, were made to go from one person to another and none was ready to accept the official letter," said the official, adding that even as police officials were trying to reason with scores of muscleman and various babas in and around the stage, Baba Ramdev reached the stage and when the police officials tried to meet him to give the letter, they were attacked. The official said Sudhir Yadav, joint commissioner of police (north), who was leading the police team that night, was hit with a stone on the face which did not hurt him, but broke his glasses. "There were lots of musclemen at the back of the stage and these were the one who decided to attack the police. They seemed to be already prepared with the offence as they had baseball bats and had collected the stones," said the official. Meanwhile, Yadav said these incidents happen while controlling a large crowd, but Ramdev should have acted in a more responsible manner. "We had received intelligence inputs about the threat to the life of Baba Ramdev and we just wanted him to evacuate the premises. However, he was not ready to listen to us. He was not ready to leave the premises either. Instead, he jumped into the crowd and kept on provoking the people to resist us," said Yadav, adding that everything happened under the eyes of media cameras and CCTVs. "The university also concluded its Open Days today and more than 20,000 prospective candidates and their parents have benefited in the span of 12 days," the official said. According to rough estimates, thousands of people from various villages of Noida and Greater Noida participated in the Ramdev's anti-corruption call against the Central government and are furious with the "politically motivated police action" taken at the behest of the government at Ramlila Maidan. Santram Bhati, a resident of Surajpur, who had a lucky escape when the police forcibly started removing people from the tents on the intervening night of June 4 and 5, said, "I know, at least, three people who were with me being roughed up by police personnel. Though it was nothing serious with my friends, the police was unleashed on the innocent people and many others were seriously injured. Despite this, I have not heard about any reaction from Rahul or Sonia Gandhi on this incident so far. This is the same Rahul who said in Bhatta-Parsaul that he felt ashamed of being an Indian. What does he have to say to Raj Bala (the injured woman who is in a critical condition after the police action) now?" Asked Sanjay. Similar sentiments were expressed by Prashant Kumar who also witnessed the police action at Ramlila Maidan. He said the double standards of the Central government, in particular Rahul, for different states had become quite evident in the matter. "If the police beats up people in Delhi, it is fine with the Congress. However, if the police reacts in UP, their leaders come rushing here. Isn't it all for votes?" Asked Kumar. No leader even went to see the injured in the hospitals, he added. A team of officials visited the village to present cheques for Rs 5 lakh each to the families of the slain farmers and Rs 2 lakh each to those with major injuries and Rs 1 lakh to farmers with minor injuries. The farmers with simple injuries were presented with cheques for Rs 25,000 each. District magistrate Gautam Budh Nagar, Deepak Agarwal, who led the team of officials, said, "We have presented 118 cheques in all, including compensation to those whose property was damaged during the violence." A few ministers like agriculture minister Laxmi Narain Singh, rural development minister Takhur Jaiveer Singh in the state government and local MPs also accompanied the team of officials to the villages. The SDM (land acquisition) has again invited people to depose relating to the clashes between the farmers and the police. A fresh date, June 17, has been fixed by the SDM for deposition. Those who want to depose can visit the District Collectorate in Surajpur on that day. The team first visited the house of farmer Rajpal Singh and the two ministers presented the cheque for Rs 5 lakh to his wife, Omwati who refused to accept the cheque, saying that it was too meagre a compensation for the life of her husband. After considerable persuasion, she accepted the cheque. Thirty farmers were presented cheques for Rs 25,000 each. The financial help of Rs 10,000 to 33 farmers whose houses had been burnt was increased to Rs 20,000 each. It has already investigated the case of Organizing Committee (OC) in which many senior officials and its former chairman Suresh Kalmadi were arrested. Director Project, PWD, Delhi government, Sudhir Kumar today said that the CBI took documents of grade separator at Raja Ram Kohli Marg, flyover at Naraina, Ghazipur grade separator, street beautification, elevated road and Ring Road bypass project. The documents were sought by the CBI three months ago. He said that most of the documents are related to tender and other procedures of construction of the projects. When asked the number of engineers and others in the CBI hit list, he said the CBI is not investigating against any particular officer. It is investigating the case as a whole. "CBI, CVC, CAG and other agencies are doing their jobs and we are doing our jobs. These projects have already been inspected. A few samples were found not up to the mark," he said. The PWD used cement of 43 grade for comprehensive strength of the flyovers. All the concrete cubes taken during execution as well as inspection passed the test, he said. On the morale of PWD engineers, he said that there was no negative effect. They are on the job. At present, the PWD is looking ahead for BRT corridors, Kalindi Kunj bypass project, East-West corridor, Barapulla Elevated Corridor Phase II, hospital buildings, seismic retrofitting of important buildings and other projects, he said. According to the police, Rattan Singh hired the accused to kill his daughter Geeta (name changed) and Durgesh Tiwari with whom she had eloped in December 2010. "However, she returned home after a month which caused humiliation to her family. Dinesh, girl's brother, allegedly wanted to kill Durgesh as he found that the boy and his sister were still continuing their relationship despite returning after the elopement. As a result, Dinesh and his father hired the accused to kill Durgesh and Geeta, said a police official. Padam and Bushan were Dinesh's school friends. As per the plan, they barged into Durgesh's home to kill him, not finding him at home, they shot down his parents, Sharda Prasad Tiwari (45) and wife Shobha (40), at Saboli village of Harsh Vihar on June 1," said a senior police. Ratan also paid them to kill his daughter and she too was murdered the same evening in the Bulandshahr area. They were arrested after secret information about their movement in Trans Yamuna yesterday. An automatic pistol of .32 bore (made in Japan) with nine live cartridges and one country-made pistol with one live cartridge seized from their possession. Dinesh and his father are absconding. This was state by Delhi unit president of the Shiromani Akali Dal (Badal) Manit Singh. He said last month, the DSGMC had given advertisement that Prime Minister Manmohan Singh would inaugurate the foundation stone-laying function of the parking lot, but he refused to the function. Later, it was advertised that Sheila Dikshit would inaugurate the function, but she also refused. As no politician is ready to spare time for the function, the DSGMC has decided to invite five personalities of "Sant Samaj" to inaugurate the foundation stone that has been yet again advertised in the periodicals, he said. He said instead of politicising the issue, president of the DSGMC Paramjit Singh Sarna should do the job honestly. He should distance himself for taking political benefits of the development work being done in the gurdwaras. The key Janak Bridge is located on the road from Tihar to Delhi Cantonment. The team was accompanied by the engineer-in-chief and other senior engineers from the MCD. "The matter was subsequently discussed at length with the commissioner. The final conclusion as to the restoration will take a few days. 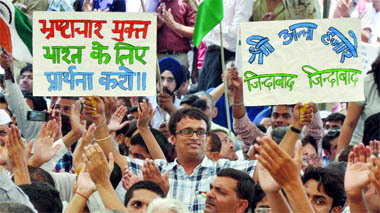 The MCD will take further action on receipt of the conclusive report of the CBRI experts," said a senior MCD official. Meanwhile, the bridge was closed for the traffic due to sagging of the structure while the MCD has yet to decide on the restoration work. The three-decade old bride was closed after a 7-inch slump was noticed in the structure. "Traffic has been closed in Delhi Cantonment to Tilak Nagar carriageway for all the vehicles. Commuters are advised to use Sagarpur flyover or Ring Road to travel from Delhi Cantonment to Jail Road," a traffic official said. The breach led to traffic problems in the area. "A team of MCD engineers led by the engineer-in-chief carried out an extensive inspection. Though the MCD is making its own technical assessment, the final decision with regard to restoration work will be taken in consultation with the CBRI only," said the official. "We would ensure that the restoration work starts at the earliest following completion of technical inputs. We would ensure minimum possible inconvenience to the people. The traffic on the bridge has been closed in consultation with the traffic police," he said. Janak Setu was constructed in 1981-82 as part of the Asian Games projects. The MCD had developed a rehabilitation plan for the bridge to restore its load bearing capacity. The plan involves an expenditure of Rs 7 crore. The conference hall located on the first floor of the club will now be used for furthering intellectual debates on various issues, the president of the Press Club TR Ramachandran said. The duo revealed that they were members of a gang of vehicle thieves and used to steal luxury cars, he said.